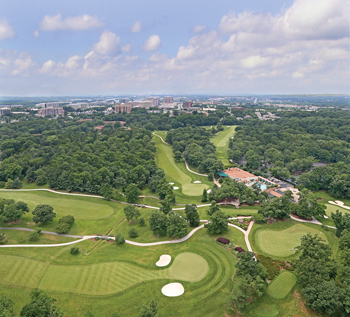 Nestled in the heart of Reston, Hidden Creek Country Club is your home away from home. Established in 1963, Hidden Creek is a family-friendly private country club with an array of first-class amenities. The centerpiece of the Club is the award-winning Ed Ault Signature Golf Course, renowned for its outstanding course conditions and tour-quality greens. Off the course, Members enjoy year-round tennis on Reston's only indoor and outdoor tennis courts, indoor and outdoor golf practice facilities, private fitness center with personal training, swimming, a spacious clubhouse with casual, upscale and outdoor dining and a full social calendar of events. For our youngest Members, Hidden Creek offers year-round junior golf and tennis programs, swim lessons and numerous camps. Conveniently located in Reston, Hidden Creek is just blocks from Reston Town Center and only 30 minutes from downtown DC with convenient Dulles Toll Road access. We invite you to visit the Club and discover firsthand the many benefits of membership at Hidden Creek. Please contact Membership Sales at 703.437.3633 or email [email protected]. As part of an ongoing Accessibility Initiative, Hidden Creek Country Club is using the Siteimprove® Intelligence Platform to help identify and prioritize accessibility issues on our website.